"GCSE" redirects here. For other uses, see GCSE (disambiguation). In the United Kingdom, the General Certificate of Secondary Education (GCSE) is an academic qualification, generally taken in a number of subjects by pupils in secondary education in England, Wales and Northern Ireland. State education in Scotland does not use GCSEs, instead its Scottish Qualifications Certificate operates National / Intermediate exams at the equivalent level, however, certain private schools in Scotland offer GCSEs, and the proportion of Scottish pupils taking GCSEs to facilitate admission to English universities is increasing. Wales: Grades A*, A, B, C, D, E, F and G.
Northern Ireland: Grades A*, A, B, C*, C, D, E, F and G.
Courses: In schools, to Year 9 and 10 students, with the course generally lasting until the end of Year 11. Also available to private candidates. Exams: Annually between May and June. A series in November is also available for mathematics and English. All units for a single subject must be taken in one examination series, although the entire course may be re-taken an unlimited number of times. Free to students in schools. Resits and private entries incur variable fees, and schools pay per student entry. ^a Irish-medium exams are only available in Northern Ireland, from the CCEA exam board. ^b Welsh-medium exams are only available in Wales, from the WJEC exam board. Each GCSE qualification is in a particular subject, and stands alone, but a suite of such qualifications (or their equivalent) is generally accepted as the record of achievement at the age of 16, in place of a leaving certificate or baccalaureate qualification in other territories. Studies for GCSE examinations generally take place over a period of two or three academic years (depending upon the subject, school, and exam board), starting in Year 9 or Year 10 for the majority of students, with examinations being sat at the end of Year 11. The GCSE was introduced as a replacement for the former O-Level (GCE Ordinary Level) and CSE (Certificate of Secondary Education) qualifications. Before the introduction of GCSEs, students took CSE (Certificate of Secondary Education) or the more academically challenging O-Level (General Certificate of Education (GCE) Ordinary Level) exams, or a combination of the two, in various subjects. The CSE broadly covered GCSE grades C-G or 4-1, and the O-Level covered grades A*-C or 9-4, but the two were independent qualifications, with different grading systems. The separate qualifications were criticised for disadvantaging the bottom 42% of O-Level entrants who failed to receive a qualification, and the highest-achieving CSE entrants who had no opportunity to demonstrate their true ability. In its later years, O-Levels were graded on a scale from A to E, with a U (ungraded) grade below that. Before 1975, the grading scheme varied between examination boards, but typically there were "pass" grades of 1 to 6 and "fail" grades of 7 to 9. However the grades were not displayed on certificates. The CSE was graded on a numerical scale from 1 to 5, with 1 being the highest, and 5 being the lowest passing grade. Below 5 there was a U (ungraded) grade. The highest grade, 1, was considered equivalent to an O-Level C grade or above, and achievement of this grade often indicated that the student could have taken an O-Level course in the subject to achieve a higher qualification. As the two were independent qualifications with separate syllabi, a separate course of study would have to be taken to "convert" a CSE to an O-Level in order to progress to A-Level. There was a previous attempt to unite these two disparate qualifications in the 1980s, with a trial "16+" examination in some subjects, awarding both a CSE and an O-Level certificate, before the GCSE was introduced. GCSEs were introduced in 1988  to establish a national qualification for those who decided to leave school at 16, without pursuing further academic study towards qualifications such as A-Levels or university degrees. They replaced the former CSE and O-Level qualifications, uniting the two qualifications to allow access to the full range of grades for more students. However the exam papers sometimes had a choice of questions designed for the more able and the less able candidates. Upon introduction, the GCSEs were graded on a letter scale, from A to G, with a C being set as roughly equivalent to an O-Level Grade C, or a CSE Grade 1, and thus achievable by roughly the top 25% of each cohort. Over time, the range of subjects offered, the format of the examinations, the regulations, the content, and the grading of GCSE examinations has altered considerably. Numerous subjects have been added and changed, and various new subjects are offered in the modern languages, ancient languages, vocational fields, and expressive arts, as well as Citizenship courses. In 1994, the A* grade was added above the grade A, to further differentiate attainment at the very highest end of the qualification. This remained the highest grade available until 2017. The youngest pupil to gain an A* grade was Thomas Barnes, who earned an A* in GCSE Mathematics at the age of 7. Between 2005 and 2010, a variety of reforms were made to GCSE qualifications, including increasing modularity and a change to the administration of non-examination assessment. From the first assessment series in 2010, controlled assessment replaced coursework in various subjects, requiring more rigorous exam-like conditions for much of the non-examination assessed work, and reducing the opportunity for outside help in coursework. Under the Conservative government of David Cameron, and Education Secretary Michael Gove, various changes were made to GCSE qualifications taken in England. Before a wide range of reforms, interim changes were made to existing qualifications, removing the January series of examinations as an option in most subjects, and requiring that 100% of the assessment in subjects from the 2014 examination series is taken at the end of the course. These were a precursor to the later reforms. From 2015, a large-scale programme of reform began in England, changing the marking criteria and syllabi for most subjects, as well as the format of qualifications, and the grading system . Under the new scheme, all GCSE subjects were revised between 2015 and 2018, and all new awards will be on the new scheme by summer 2020. The new qualifications are designed such that most exams will be taken at the end of a full 2-year course, with no interim modular assessment, coursework, or controlled assessment, except where necessary (such as in the arts). Some subjects will retain coursework on a non-assessed basis, with the completion of certain experiments in science subjects being assumed in examinations, and teacher reporting of spoken language participation for English GCSEs as a separate report. Other changes include the move to a numerical grading system, to differentiate the new qualifications from the old-style letter-graded GCSEs, publication of core content requirements for all subjects, and an increase in longer, essay-style questions to challenge students more. Alongside this, a variety of low-uptake qualifications and qualifications with significant overlap will cease, with their content being removed from the GCSE options, or incorporated into similar qualifications. GCSE examinations in English and mathematics were reformed with the 2015 syllabus publications, with these first examinations taking places in 2017. The remainder were reformed with the 2016 and 2017 syllabus publications, leading to first awards in 2018 and 2019, respectively. Qualifications that are not reformed will cease to be available in England. The science reforms, in particular, mean that single-award "science" and "additional science" options are no longer available, being replaced with a double award "combined science" option (graded on the scale 9-9 to 1-1 and equivalent to 2 GCSEs). Alternatively, students can take separate qualifications in chemistry, biology, and physics. Other removed qualifications include a variety of design technology subjects, which are reformed into a single "design and technology" subject with multiple options, and various catering and nutrition qualifications, which are folded into "food technology". Finally, several "umbrella" GCSEs such as "humanities", "performing arts", and "expressive arts" are dissolved, with those wishing to study those subjects needing to take separate qualifications in the incorporated subjects. These reforms do not directly apply in Wales and Northern Ireland, where GCSEs will continue to be available on the A*-G grading system. However, due to legislative requirements for comparability between GCSEs in the three countries, and allowances for certain subjects and qualifications to be available in Wales and Northern Ireland, some 9-1 qualifications will be available, and the other changes are mostly adopted in these countries as well. In Northern Ireland, a decision was taken by Minister of Education, Peter Wier (DUP), in 2016 to align the A* Grade to the 9 Grade of the English reformed qualifications. The first award of the new A* grade being in 2019. A C* grade was also introduced in Northern Ireland to align to the 5 Grade in England, again with first awarding in 2019. GCSEs in Northern Ireland remain modular and science practicals can count towards the overall grade outcome. Speaking and listening also remains a component of the GCSE English Language specification. Historically, there were a variety of regional examination boards, or awarding organisations (AOs), who set examinations in their area. Over time, as deregulation allowed schools to choose which boards to use, mergers and closures led to only 5 examination boards remaining today. Assessment and Qualifications Alliance (AQA), which absorbed the following boards: AEB, JMB, NEAB, and SEG. Oxford, Cambridge and RSA Examinations (OCR), which absorbed the Oxford and Cambridge, MEG, and RSA exam boards. Pearson Edexcel, which absorbed the LREB, BTEC, and ULEAC boards. Welsh Joint Education Committee (WJEC or CBAC), the main examining board in Wales. Council for the Curriculum, Examinations & Assessment (CCEA), the examining board and regulator in Northern Ireland. The examination boards operate under the supervision of Ofqual (The Office of Qualifications and Examinations Regulation) in England, Qualifications Wales in Wales, and the CCEA in Northern Ireland. In England, AQA, OCR, and Pearson operate under their respective brands. Additionally, WJEC operate the brand Eduqas, which develops qualifications in England. CCEA qualifications are not available in England. In Wales, WJEC is the only accredited awarding body for GCSEs in the public sector, and thus no other board formally operates in Wales. However, some qualifications from the English boards are available as designated qualifications in some circumstances, due to not being available from WJEC. In Northern Ireland, CCEA operates as both a board and a regulator. Most qualifications from the English boards are also available, with the exception of English language and the sciences, due to requirements for speaking and practical assessment, respectively. Students usually take at least 5 GCSEs in Key Stage 4, in order to satisfy the long-standing headline measure of achieving 5 A*-C grades, including English and mathematics. The exact qualifications taken by students vary from school to school and student to student, but schools are encouraged to offer at least one pathway that leads to qualification for the English Baccalaureate, requiring GCSEs in English language, English literature, mathematics, 2 science GCSEs, a modern or ancient language, and either history or geography. The list of currently available GCSE subjects is much shorter than before the reforms, as the new qualifications in England all have core requirements set by the regulator, Ofqual, for each subject. In addition, there are several subjects where only one board offers qualifications, including some that are only available in one country of the UK for that reason. The following lists are sourced from the exam board websites. These are the requirements for achieving the English Baccalaureate headline measure in league tables, from 2017 onwards. The Baccalaureate itself does not garner a certificate for students. Other subjects, especially religious studies, computer science, or physical education, may be compulsory in some schools as these subjects form part of the National Curriculum at Key Stage 4. GCSEs are awarded on a graded scale, and cross two levels of the Regulated Qualifications Framework (RQF): Level 1 and Level 2. These two levels roughly correspond, respectively, to foundation and higher tier in tiered GCSE qualifications. Level 1 qualifications constitute GCSEs at grades G, F, E, and D or 1, 2, and 3. Level 2 qualifications are those at grades C, B, A, and A* or 4, 5, 6, 7, 8, and 9. The tiering of qualifications allows a subset of grades to be reached in a specific tier's paper. Formerly, many subjects were tiered, but with the mid-2010s reform, the number of tiered subjects reduced dramatically, including the removal of tiering from the GCSE English specifications. Untiered papers allow any grade to be achieved. Coursework and controlled assessment tasks are always untiered. In the past, mathematics qualifications offered a different set of tiers, with three. These were foundation tier at grades G, F, E, and D; intermediate tier at grades E, D, C, and B; and higher tier at grades C, B, A, and A*. This eventually changed to match the tiers in all other GCSE qualifications. GCSE grades 9 to 4 (A* to C) – Certificate and qualification awarded. At GCSE, considered a 'good pass', and awards a qualification at Level 2 of the RQF. GCSE grades 3 to 1 (D to G) – Certificate and qualification awarded. At GCSE, awards a qualification at Level 1 of the RQF. When GCSEs were first introduced in 1988, they were graded on a letter scale in each subject: A, B, C, D, E, F, and G being pass grades, with a U (unclassified) grade below that which did not qualify the student for a certificate. These grades were initially set such that a GCSE grade C was equivalent to an O-Level grade C or a CSE grade 1, though changes in marking criteria and boundaries over the years mean that this comparison is only approximate. Infrequently, X and Q grades are awarded. X indicates that a course was not completed in full, and therefore an appropriate grade cannot be calculated. The Q (query) grade is a temporary grade that requires the school to contact the examining body. These latter two grades are both usually provisional, and are replaced with a regular grade once any issues have been resolved. X grades are also sometimes used for other purposes, on rare occasions, such as to indicate that an examiner found offensive material or hate speech within a student's responses. In some cases, this may lead to the student losing all marks for that paper or course. These grades are most common in subjects which discuss ethical issues, such as biology, religious studies, and citizenship. In 1994, an A* grade was added above the initial A grade to indicate exceptional achievement, above the level required for the A grade. Under the letter grade scheme, foundation tier papers assess content at grades C to G, while higher tier papers assess content at grades A* to C. In foundation tier papers, the student can obtain a maximum grade of a C, while in a higher tier paper, they can achieve a minimum grade of a D. If a higher tier candidate misses the D grade by a small margin, they are awarded an E. Otherwise, the grade below E in these papers is U. In untiered papers, students can achieve any grade in the scheme. This scheme is being phased out in England, but remains in Wales and Northern Ireland. In Northern Ireland, the A* grade has been adjusted upwards with the introduction of the numerical scheme in England, such that an A* is equivalent to a new English grade 9. Northern Ireland also added a C* grade to line up with the grade 5 in the English grading. From 2017 in England (and in Wales and Northern Ireland on qualifications from the English-based awarding bodies), some GCSEs are now assessed on a 9-point scale, using numbers from 9 to 1, and, like before, a U (unclassified) grade for achievement below the minimum pass mark. Under this system, 9 is the highest grade, and is set above the former A* classification, equivalent to the new Northern Irish A* grade. The former C grade is set at grade 4 and the lower end of grade 5, with grade 5 being considered a "good pass" under the new scheme. Although fewer qualifications have tiered examinations than before, the tiering system still exists. At foundation tier, the grades 1, 2, 3, 4, and 5 are available, while at higher tier, the grades 4, 5, 6, 7, 8, and 9 are targeted. Once again, if a higher tier student misses the grade 4 mark by a small margin, they are awarded a grade 3, and controlled assessment and coursework tasks are untiered. 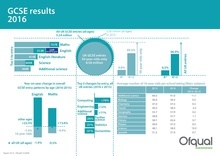 Infographic from Ofqual showing statistics about GCSE entries in 2016. 5.24 million people took a GCSE in that year. GCSE results are published by the examination board in August, for the previous exam series in April to June of the same year. They are usually released one week after the A-Level results, in the fourth week of August on a Thursday. The examination results are released to centres (schools) prior to the release to candidates and the public. Examination results are released by the Joint Council for Qualifications (JCQ), which represents the main GCSE awarding organisations. Some boards and schools release results online, although many still require students to attend in person to collect their results from the centre they sat exams at. In England, these results then go on to inform league tables published in the following academic year, with headline performance metrics for each school. Source: Joint Council for General Qualifications via Brian Stubbs. Note: In the final year DES statistics for O-Levels are available, and across all subjects, 6.8% of candidates obtained a grade A, and 39.8% achieved grades A to C.
In the past, many GCSE qualifications used a modular system, where some assessment (up to 60% under the 'terminal rule') could be submitted prior to the final examination series. This allowed for students to take some units of a GCSE before the final examination series, and thus gave indication of progress and ability at various stages, as well as allowing for students to resit exams in which they did not score as highly, in order to boost their grade, before receiving the qualification. Various qualifications were available as both modular and linear schemes, and schools could choose whichever fit best for them. Under the Conservative government of David Cameron, and Education Secretary Michael Gove, reforms were initiated which converted all GCSEs from 2012 (for assessment from 2014) to de facto linear schemes, in advance of the introduction of new specifications between 2015 and 2018 (for first assessment from 2017 to 2020). These new rules required that 100% of the assessment in a GCSE be submitted in the final examination series, at the same time as applying for certification of the full qualification. The examination boards complied by modifying the syllabi of the remaining GCSE qualifications to remove modular components. subjects. Both modular and linear assessment have been politically contentious, and the opposition Labour Party UK, and particularly the former MP Tristram Hunt stated that it was their policy that such reforms be halted and reversed, maintaining modular assessment in both GCSEs and A-Levels. The modular scheme is supported by the University of Oxford and the University of Cambridge. In some subjects, one or more controlled assessment or coursework assignments may also be completed. These may contribute either a small or large proportion of the final grade. In practical and performance subjects, they generally have a heavier weighting to reflect the difficulty and potential unfairness of conducting examinations in these areas. In the past, these were available in a variety of subjects, including extended writing in English, the sciences, business, and foreign languages; practical assessment in the sciences and technology subjects; and speaking assessments in languages. Since the 2010s reform, the availability has been cut back, with mostly only design and technology subjects and performing arts retaining their controlled assessment contributions. In English Language, the spoken language assessment has been downgraded to an endorsement which is reported separately on the English certificate, not contributing to the grade. The English spoken language assessments are set throughout the course and assessed by teachers. Students can be awarded a Pass, Merit, Distinction or Not Classified. In the sciences, practical exercises are a required part of the qualification, but are not directly assessed; they are only endorsed by a teacher's statement. The balance between controlled assessment and examinations is contentious, with the time needing to be set aside for coursework sessions being seen as a burden on the school timetable. However, the use of controlled assessment allows for the marking of some work outside of examination season, and can ease the burden on students to perform well on the day of the examination. Any of the above must be approved by the examination board. Other forms of help are available with the agreement of the examination board, but the above are the most common. If a student is ill or an unforeseen circumstance occurs that may affect their performance in an examination, they can apply for special consideration from the examination board. The procedures vary depending on how much the student has completed[clarification needed], but in the case of sitting an examination, they may receive a percentage increase on their grade[clarification needed] to reflect this, or a consideration of their coursework and other assessment alongside their predicted grades, to calculate a fair grade based on their other attainment. GCSEs, BTECs or other Level 2 qualifications are generally required in order to pursue Level 3 qualifications such as A-Levels or BTEC Extended Diplomas beyond the age of 16. The requirement of 5 or more A*–C or 9-4 grades, including English and mathematics, is often a requirement for post-16 qualifications in sixth form colleges or further education colleges after leaving secondary school. Where the subject taken post-16 has also been taken at GCSE, it is often required that the student achieved a grade C, 4, or 5 as a minimum at GCSE. Most universities, in addition to their post-16 requirements, seek that their candidates have grades of C or 4 or higher in GCSE English and mathematics. Many of those who achieve below this standard will later retake GCSE English and mathematics to improve their grade. The November examination series exists for this purpose, to allow a faster path to gain these grades than waiting until the following summer's main series. Leading universities often take into account performance at GCSE level, sometimes expecting applicants to have a high proportion of A and A* grades. GCSEs in England, Wales, and Northern Ireland are part of the Regulated Qualifications Framework. A GCSE at grades G, F, E, D, 1, 2, or 3 is a Level 1 qualification. A GCSE at C, B, A, A*, 4, 5, 6, 7, 8, or 9 is a Level 2 qualification. Qualifications are not awarded to grades U, X or Q. Level 2 qualifications are much more sought-after, and generally form minimum requirements for jobs and further study expectations. The BTEC is another Level 1/2 qualification available in the same territories as the GCSE, and is graded at 5 levels. At Level 2, comparable to A*, A, B, and C respectively are the Distinction*, Distinction, Merit, and Pass. A BTEC at Level 1 is simply marked as "Level 1", with no subdivision. Below that level, a U is awarded, as in GCSEs. Other qualifications at this level include Cambridge Nationals, Key Skills, and Functional Skills. The comparable qualifications in Scotland are the National 4 and National 5 awards (formerly Standard Grades and/or Intermediates). Public and private schools in the UK choose to enter their students for IGCSE examinations. The education systems of current and former British territories, such as Gibraltar, and Nigeria, also offer the qualification, as supplied by the same examination boards. Other former British colonies, such as Singapore and Zimbabwe, continue to use the O-Level qualification. The international version of the GCSE is the IGCSE, which can be taken anywhere in the world and includes additional options relating to coursework and the language the qualification is pursued in. All subjects completed in the fifth of the European Baccalaureate are generally equivalent to the GCSEs subjects. In the Republic of Ireland, the Junior Certificate is a comparable qualification. In the United States, the high school diploma is required for entry to college. In the UK, this is considered to be at the level of the GCSE, awarded at Year 11. For college and university admissions, the high school diploma may be accepted in lieu of the GCSE if an average grade better than D+ is obtained in subjects with a GCSE counterpart. As A-Levels are generally expected for university admission, the high school diploma is not considered enough for university entry in the UK. Advanced Placement programmes or International Baccalaureate are considered equal to the A-Level, earn points on the UCAS tariff, and may therefore be accepted in lieu of A-Levels for university entry in the UK by US students. The SAT Reasoning Test and SAT Subject Tests, or the ACT may also be considered in an offer for university entry. Statistics released by London's Poverty Profile found overall GCSE attainment in London to be greater than the rest of England. 39% of pupils in Inner London and 37% in Outer London did not get five GCSEs at A* to C, compared with 42% in the rest of England. Also, according to an ITV News report, UK students tend to outperform Jersey students on GCSE examinations. Gender bias is another area of concern. Department of Education data shows that the relative performance gap between girls and boys widened significantly under GCSEs, compared with O-Levels. The declining number of pupils studying foreign languages in the UK has been a major concern of educational experts for many years. Paul Steer, the Exam Board Chief of the British exam board OCR recently expressed that "unless we act soon, even GCSE French and German could face the chop". Moreover, the publication of "soft" subjects (e.g. Critical Thinking, General Studies etc.) and "academic" subjects (e.g. Mathematics, Sciences, Languages) for GCSEs and A-Levels by the universities of Oxford and Cambridge has created an ongoing educational debate where, on the one hand, many educational experts would support this "division of importance" whereas, on the other hand, many head teachers would not only disagree but actually "oppose a move to solely traditional academic GCSE (and A-Level) subjects". When the GCSE system was introduced, there were comments that it was a dumbing down from the previous GCE O-Level system (as it took the focus away from the theoretical side of many subjects, and taught pupils about real-world implications and issues relating to ICT and citizenship). In addition, the proportions of candidates awarded high grades at GCSE have been rising for many years, which critics attribute to grade inflation. By comparing pupils' scores in the YELLIS ability test with their GCSE results over a period of about 20 years, Robert Coe found a general improvement in grades awarded which ranges from 0.2 (science) to 0.8 (maths) of a GCSE grade. Only slightly more than half of pupils sitting GCSE exams achieve the 5 A* to C grades required for most forms of academic further education. One of the important differences between previous educational qualifications (and the earlier grading of A-Levels) and the later GCSE qualifications was supposed to be a move from norm-referenced marking to criterion-referenced marking. In a norm-referenced grading system, fixed percentages of candidates achieve each grade. With criterion-referenced grades, in theory, all candidates who achieve the criteria can achieve the grade. A comparison of a clearly norm-referenced assessment, such as the NFER Cognitive Ability Test or CAT, with GCSE grading seems to show an unexpected correlation, which challenges the idea that the GCSE is a properly criterion-based assessment. The Association of School and College Leaders (ASCL) surveyed 606 headteachers from schools that had entered pupils for the new GCSE. They found reports of panic attacks, sleepless nights, depression, extreme fatigue, self-harming, and suicidal thoughts. The incorporation of GCSE awards into school league tables, and the setting of targets at school level at above national average levels of attainment, has been criticised. At the time of introduction, the E grade was intended to be equivalent to the CSE grade 4, and so obtainable by a candidate of average/median ability. Sir Keith Joseph set schools a target of 90% of their pupils obtaining at least a grade F (which was the "average" grade achieved in the past). This target was reached nationally about 20 years later. David Blunkett went further and set schools the goal of 50% of 16-year-olds gaining 5 GCSEs or equivalent at grade C and above, although these grades were previously only obtained by the top 30%. This was achieved with the help of equivalent and largely vocational qualifications. [clarification needed] Labelling schools as failing if 40% of their pupils do not achieve at least 5 Cs, including English and Maths at GCSE, has also been criticised, as it essentially requires 40% of each intake to achieve the grades only obtained by the top 20% when GCSE was introduced. In recent years, concerns about standards has led some public schools to complement GCSEs with IGCSEs within their curriculum, and to take their pupils straight[not in citation given] to A-Level or the BTEC. Other schools, such as Manchester Grammar School, are replacing the GCSEs with IGCSEs in which there is an option to do no coursework. The new science syllabus has led to many public schools switching to the IGCSE Double Award syllabus. The answers showed that in 2017-18, 91% of international GCSE entries in core (EBacc) subjects were in independent schools. A student in an independent school was 136 times more likely to follow an IGCSE than one in a state-funded school. Looking at entries in non-EBacc and EBacc subjects shows that three out of every four IGCSEs were sat in private schools. In one incident, there were complaints about a question in a GCSE maths exam, which became known as the "Hannah's sweets" question. This probability question which required the student to extract information from prose and then to form a quadratic equation, was said to be very difficult, and this was reported on several media websites. Teachers, experts, and students posted the solution to the question on the media. In another case, concerning the 2016 GCSE biology exam, there were complaints about the apparent lack of biology content in the exam. One of the questions in the biology exam asked students to define an “independent company”, which some students perceived to be a business studies question. The May 2017 English literature exam (under the regulation of OCR) wrongly implied that Tybalt, a character in Romeo and Juliet was not a Capulet. This serious flaw in the question confused many of the students. OCR accepted responsibility and claimed no pupil would be disadvantaged. The question was worth 40 marks. ^ Brooks, Ron (2014) [First published 1991]. "A decade and more of debate". Contemporary Debates in Education: An Historical Perspective. New York: Routledge. pp. 21–23. ISBN 978-0-582-05797-5. OL 1863538M. ^ Tytler, David (25 August 1988). "GCSE examiners 'very impressed' after results study". The Times (London, England) (63169): 6. ^ "Boy, 7, becomes youngest child to get A* in maths GCSE". dailymail.co.uk. ^ "GCSE 2012 French/German/Spanish Specification" (PDF). ocr.org.uk. May 2012. Retrieved 27 November 2017. ^ "Get the facts: GCSE reform - GOV.UK". www.gov.uk. Retrieved 27 November 2017. ^ "Here's what the new GCSE grades mean". The Independent. 22 August 2017. Retrieved 27 November 2017. ^ "Completing GCSE, AS and A level Reform - GOV.UK". www.gov.uk. Retrieved 27 November 2017. ^ Ofqual; Qualifications Wales; CCEA (August 2017). "Statement from the qualification regulators on changes to GCSEs, AS and A levels" (PDF). ccea.org.uk. Retrieved 27 November 2017. ^ "Statement from Minister of Education, Northern Ireland, on changes to GCSE grading" (PDF). ccea.org.uk. June 2016. Retrieved 17 November 2018. ^ Weir, Peter (28 June 2016). "ORAL STATEMENT ON GCSE QUALIFICATION MARKET AND GRADING - 28 JUNE 2016" (PDF). education-ni.gov.uk. Retrieved 27 November 2017. ^ "First teaching from 2015 and 2016 | Pearson qualifications". qualifications.pearson.com. Retrieved 29 November 2017. ^ "First teaching from 2017 | Pearson qualifications". qualifications.pearson.com. Retrieved 29 November 2017. ^ "First teaching from 2018 | Pearson qualifications". qualifications.pearson.com. Retrieved 29 November 2017. ^ "WJEC GCSE Qualifications". wjec.co.uk. Retrieved 29 November 2017. ^ "Qualifications". www.aqa.org.uk. Retrieved 29 November 2017. ^ "Qualifications". www.eduqas.co.uk. Retrieved 29 November 2017. ^ "Latest news and information on the GCSE reform programme - OCR". ocr.org.uk. Retrieved 29 November 2017. ^ CCEA (12 February 2014). "General Certificate of Secondary Education (GCSE)". ccea.org.uk. Retrieved 29 November 2017. ^ CCEA (31 July 2017). "A Guide to Changes in GCSE Grading". ccea.org.uk. Retrieved 29 November 2017. ^ "Edexcel's online results service". Edexcel. Retrieved 27 July 2008. ^ "GCSE National subject grade percentages". Bstubbs.co.uk. Retrieved 17 June 2013. ^ "GCSE National subject grade percentages". Bstubbs.co.uk. Retrieved 8 September 2018. ^ a b "GCSE reforms". Edexcel.com. Retrieved 14 June 2015. ^ "[ARCHIVED CONTENT] Changes to A levels - The Department for Education". Education.gov.uk. Archived from the original on 30 April 2014. Retrieved 14 June 2015. ^ a b "Latest news and information on the GCSE reform programme - OCR". Ocr.org.uk. Retrieved 14 June 2015. ^ "Edexcel A levels". Edexcel.com. Retrieved 14 June 2015. ^ "Labour pledges to halt A-Level reforms". Teachingtimes.com. Retrieved 14 June 2015. ^ "Oxford academics cast doubt on GCSE claims". Tes.co.uk. Archived from the original on 25 November 2014. Retrieved 14 June 2015. ^ "Oxford admissions head sounds warning over exam changes". Times Higher Education. Retrieved 14 June 2015. ^ "Cambridge urges schools to enter students for AS-levels". BBC News. Retrieved 14 June 2015. ^ "Entry requirements for Accounting and Finance | University of Bath". Bath.ac.uk. Archived from the original on 27 May 2013. Retrieved 17 June 2013. ^ "Bristol University | Department of Computer Science | Undergraduate courses". Cs.bris.ac.uk. 26 February 2013. Retrieved 17 June 2013. ^ "Department of Economics - Departmental admissions criteria 2013 - How to apply - Undergraduate - Study - Home". .lse.ac.uk. 1 October 2012. Retrieved 17 June 2013. ^ "Entrance Requirements - University of Oxford". Ox.ac.uk. Retrieved 17 June 2013. ^ a b c Helm, Toby (29 December 2018). "Exam reforms boost private pupils in race for universities". The Guardian. Retrieved 30 December 2018. ^ L R Hand. "Education Vocabulary - Learn English Vocabulary". Learningenglish.de. Retrieved 14 June 2015. ^ "GCE O-Level". SEAB. Archived from the original on 19 November 2018. Retrieved 28 December 2018. ^ a b "International Qualifications for entry into college or university in 2013" (PDF). Arts.ac.uk. Archived from the original (PDF) on 25 December 2016. Retrieved 11 October 2017. ^ "Info for US Families". Chavegnes International College. Retrieved 11 October 2017. ^ Trust for London and New Policy Institute. "Education". Londonspovertyprofile.org.uk. Retrieved 14 June 2015. ^ "UK students outperforming Jersey GCSE students". ITV News. Retrieved 14 June 2015. ^ National Archives. "Department for Education" (PDF). Department for Education. Department for Education. Archived from the original (PDF) on 1 April 2013. Retrieved 13 February 2017. ^ "Exam board chief: 'Unless we act soon, even GCSE French and German could face the chop'". Tes.co.uk. Retrieved 14 June 2015. ^ "Heads 'oppose move to traditional academic GCSE subjects' - BT". Home.bt.com. 26 August 2015. Retrieved 23 December 2015. ^ "Were O-Levels Harder Than GCSEs?". Laura McInerney. Retrieved 5 December 2016. ^ "House of Commons Hansard Written Answers for 27 Feb 2006 (pt 136)". Publications.parliament.uk. Retrieved 14 June 2015. ^ Matthew;, Baxter, (6 December 2000). "Monitoring progress and target setting in the secondary school: finding appropriate methods of data collection and analysis". Leeds.ac.uk. Retrieved 11 October 2017. ^ Pells, Rachael (24 August 2017). "Tough new GCSE exams risk pupils' mental health, warn school leaders". The Independent. Retrieved 30 December 2018. ^ Roberts, John (22 August 2018). "GCSEs 2018: New exams 'taking toll on pupils' mental health' | Tes". www.tes.com. Retrieved 30 December 2018. ^ Davidson, Amelia (21 August 2018). "GCSE results: 'The exam cycle shrank my happiness' | Tes". www.tes.com. Retrieved 30 December 2018. ^ Geddes, Diana (27 January 1982). "Poor marks for maths teaching". The Times (London, England) (61142). The Times (London, England). The Times (London, England). Retrieved 12 September 2015. ^ Sheldon, N. "History examinations from the 1960s to the present day". history.ac.uk. history.ac.uk. Archived from the original on 26 November 2013. Retrieved 13 September 2015. ^ Richardson, Hannah; Sellgren, Katherine. "School league tables branded a 'nonsense' amid changes". BBC News. BBC. Retrieved 13 September 2015. ^ Malnick, Edward. "GCSE performance tables: Number of failing schools doubles in a year". The Telegraph. The Telegraph. Retrieved 13 September 2015. ^ "The Independent - 404". The Independent. London. Retrieved 14 June 2015. ^ "BBC NEWS - UK - Education - 'Give schools freedom of choice'". BBC News. 25 October 2006. Retrieved 14 June 2015. ^ Garner, Richard (29 September 2007). "Majority of private schools 'ditched at least one GCSE'". The Independent. London. Retrieved 14 June 2015. ^ Siddique, Haroon (30 December 2018). "Labour demands inquiry into how GCSE reform has benefited private schools". The Guardian. Retrieved 30 December 2018. ^ Paton, Graeme (4 November 2009). "GCSE alternative 'banned' in state schools". Retrieved 30 December 2018. ^ "Anger over 'harsh' English GCSE grades". BBC News. 23 August 2012. Retrieved 14 June 2015. ^ Bellos, Alex (5 June 2015). "How to solve the maths GCSE question about Hannah's sweets that went viral". The Guardian. Retrieved 23 December 2015. ^ "This is the GCSE biology exam that left students in tears: Could you answer the questions?". International Business Times UK. 20 May 2016. Retrieved 21 May 2017. ^ Espinoza, Javier (17 May 2016). "Students left 'fuming' over GCSE biology exam that contained questions about drunk 15-year-olds". The Telegraph. Retrieved 11 October 2017. ^ Mills, Jen (17 May 2016). "Fury over GCSE biology exam that had 'no biology' in it". Metro. Retrieved 11 October 2017. ^ "GCSE exam pupils baffled by 'business studies' question in biology paper". The Guardian. Press Association. 17 May 2016. Retrieved 11 October 2017. ^ Marsh, Sarah (26 May 2017). "A plague o' both your houses: error in GCSE exam paper forces apology". The Guardian. ISSN 0261-3077. Retrieved 15 December 2018. The Guardian, 3 September 2005, "Top independent school to ditch GCSE science"